Fran passed away Friday, September 7, 2018 at Alamo Nursing Home. She was born July 14, 1916 in Gobles the daughter of Vernon and Isa (Giddings) Niles. Fran enjoyed dancing, shopping, doing crossword puzzles, trips to the casino and playing bridge with her bridge club. 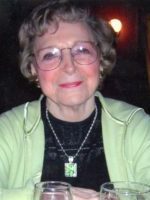 She was a member of the Otsego Elks, Otsego VFW Ladies Auxiliary and the United Methodist Church of Otsego. On November 16, 1936 she married Raymond “Rake” Myers who passed away in 1995. Surviving are her sons, Dean (Sharon) Myers of Alamo and Dennis (Donna Beaman) Myers of Gobles; 3 grandchildren, Kelli (Matt) Drobny, Gene (Tina) Myers and Shane (Tracy) Myers; 6 great-grandchildren, Charlee, Matt, Morgan, Chase, Mike and Connor and 2 great-great-grandchildren. She was preceded in death by her parents; husband; sister, Elaine Brown and daughter-in-law, Oneta Myers. A memorial service will be held at 1:00 P.M., Thursday, September 13, 2018 at the Winkel Funeral Home, Otsego with Pastor Joe Shaler officiating. Contributions in memory of Fran may be made to Otsego VFW Post #3030 or the American Cancer Society. Thoughts and prayers are with you and your families. Fran was a wonderful person. Sorry to be out of town next week so will miss her memorial. Dean,Sharon and family sorry for your loss. Sending thoughts and our prayers. Sending prayer to you in this difficult time. Sending prayers to you in this difficult time. Sharon, so sorry I read about your mother in law. Sharon, so very sorry to hear about your mother in law. May God’s grace be with you and your family. Dean and family. I was so sorry to see Fran had passed. She was a fun lady. May you find peace and joy in all your fond memories. Myers Family; Our condolence to your family on Fran’s passing. I have many memories of her, she was like my second mother growing up. A truly wonderful person. Our thoughts and prayers are with all of you during this difficult time. So sorry Dean and Dennis. I have fond memories of being neighbors for so many years. My love and prayers.